Having served in executive-level management roles for more than a decade, 63-year-old businessman Jim Lizza has become accustomed to giving back through career-development and mentorship programs. Now, he is cruising for a cause in a different kind of way. 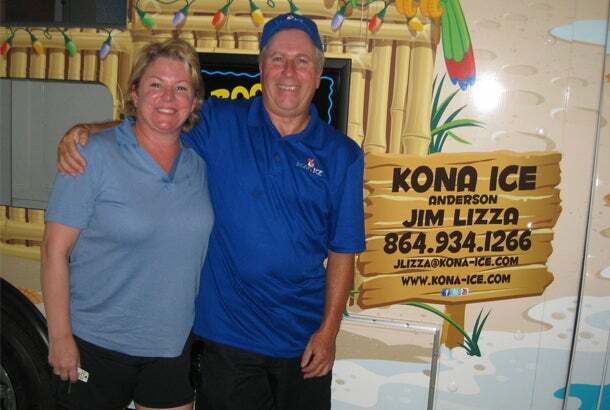 Lizza is the owner of Kona Ice of Anderson, S.C. With his tropical, Caribbean-themed shaved ice truck, Lizza is hosting a series of Kona Days or mini, reoccurring fundraising events for local schools in the area. For each special event at the school, Lizza donates 25 percent of his proceeds to the school, which is used to fund new text books, white boards, school trips and other necessities. In less than six months, Lizza has raised more than $6,000 for Anderson and Clemson area schools. He is a smart business man on a mission to make a big difference for families in the community. Below, Lizza reveals how and why he became a franchisee in the Kona Ice chain. Franchise owned: Kona Ice of Anderson, S.C.
We launched our business in June of 2014. After I retired, I was looking for another business venture to pursue. My neighbor, Bridget Torregrosa, overheard that I was researching franchise opportunities. She told me about one of her friends who had a Kona Ice business. She also mentioned that Kona Ice gives back a hefty percentage of its proceeds to local schools, sports teams and charities, which appealed to me. I couldn’t think of a better way to spend my retirement. Bridget said that she was thinking about joining Kona Ice herself, but due to her career, did not have time to operate a franchise on her own. From there, I began researching the franchise, its leadership team and ultimately decided to become business partners with Bridget. I was the international sales anager for a small company in the Southeast. There is nothing else on the market like Kona Ice. I am very passionate about my community and I love how Kona Ice empowers me to do my part and give back to my friends, family and neighbors in Anderson. The startup investment fee to own a Kona Ice business is $104,650, which includes the $15,000 franchise fee and $89,650 truck. Kona Ice offers a range of financing options for interested franchisees. To learn more, visit ownakona.com. By a long shot, the most advice I received came from a nearby Kona Ice franchisee, Scott Mackey. He is located about 30 miles away from Anderson and invited me to spend the day with him and his Kona Ice truck. I saw firsthand Scott’s close ties with his local community -- almost everyone we drove past recognized his truck and warmly greeted us. The experience was invaluable and led me to launch Kona Ice of Anderson. Additionally, I did my due diligence and called as many Kona Ice franchisees as I could. I also spent time meeting with the brand’s leadership team. The most unexpected challenge was developing the market, especially partnerships with the Anderson school systems and our local universities. The vetting process took more than a few months. Fortunately, I had plenty of support and guidance from the corporate office along the way. Every prospective franchise owner should have enough cash reserved for working and living expenses while they are getting their businesses off of the ground. Growing a lucrative business takes some time, and it is always a good idea to prepare for a few rainy days. At the moment, we are working on building partnerships with local schools and other organizations throughout the community. We are excited about the future, and look forward to continue growing our local influence in the months and years to come.